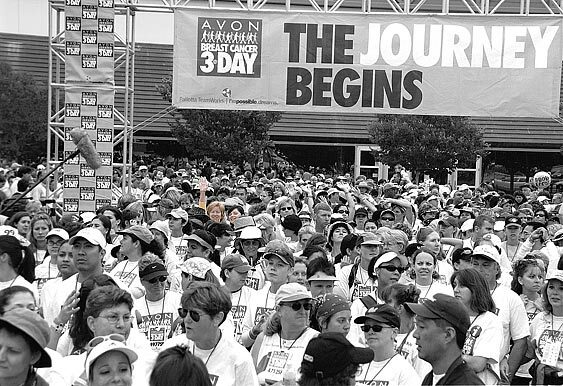 In July 2001 she completed her first Avon Breast Cancer 3-Day walk. Surely everyone knows about these type of events now: if you’re one of the few people in the world who hasn’t been on the receiving end of a fundraising letter from me or my mom, you have to at least know that organizations like Susan G. Komen, Avon, Nike and Revlon are really into these “Race for the Cure” and “Woman’s Marathon” events to benefit cancer research. For months, she trained and trained and trained. The actual walk in San Francisco was three days and 60 miles long. To put it into perspective for those non-walkers: that’s a helluva lot of walking! She also fundraised. For every 3-Day walk (at the time it was sponsored by Avon; now the Susan G. Komen Foundation organizes the 3-Day) participants must raise a minimum amount of money that is put toward breast cancer research; in 2001, it was $1,900. She joined a team of walkers in the Bay Area. They met twice a week to train, completing walks all around the Bay Area. At first the walks were short; 5-7 miles. But as the months passed and the 3-Day became closer, the training walks lengthened; 15-20 miles. That’s a lot of water, blisters, and pairs of socks. The 2001 3-Day officially started on Friday, July 27th in Menlo Park, California. It ended on Sunday, July 29th at Marina Green in San Francisco with a 5 pm closing ceremony. My dad decided we would go into the city that Sunday to cheer on Mom at the end of the walk. I remember how amazed I was by the number of walkers. There were just so many people! The most memorable part of the experience was definitely the Survivor Circle. At the start of the closing ceremony, each walker was given an official 3-Day t-shirt; most were blue, but the breast cancer survivors received pink shirts. All of the survivors walked into the closing ceremony together. I knew my mom was one of them! A touching moment for an eleven-year-old. That’s a lot of walking, and a lot of fundraising! Crew members don’t walk (they handle all of the behind-the-scenes work that makes the event fun for the walkers), but they still have to fundraise. Between all of these walks (and the two she did with me; see the later blog post), my mom raised $35,000 for breast cancer research! You can put a number on the amount of money raised, but the memories a 3-Day walker has from the event are priceless. Aww, cheesy, I know. This entry was posted in Breast cancer, Charity walks and tagged Avon, Breast cancer, charity walks, fundraising walks, Susan G. Komen by Rachel Joy Horn. Bookmark the permalink.